What are the biggest risks to the UK? Is it terrorism, climate change or maybe even cyber warfare? All of these are important problems, however you may be surprised to learn that pandemic flu is seen by the government as the biggest major risk to the UK. In an important new BBC science project called Contagion! mathematician Hannah Fry has been working with the public to help prevent the next big pandemic flu outbreak. It takes around four months to produce a new vaccine, meaning that when pandemic strikes, vaccines won’t be the first line of defence. Instead researchers rely on mathematical models which predict how a disease might spread. 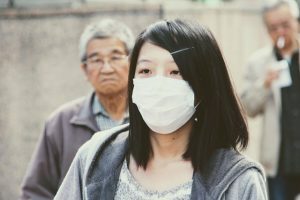 If governments can understand how diseases spread, then they will be able to limit the outbreak by taking strategic decisions such as closing schools. A pandemic outbreak of flu could go on for months, meaning that it will be impossible to shut down the whole country, and that the government needs to know which measures will be most effective. Why is the government so worried about flu? Scientists agree that it is inevitable that there will be a pandemic outbreak of flu. The most serious outbreak of recent times was called the Spanish flu of 1918, which led to the deaths of 50-100 million people worldwide. At the height of the epidemic, around 15,000 people died within the space of a single week in the UK. This is a huge death toll, and it is the fear of this happening again which means that the UK government invests a lot of resources in preparing for a similar outbreak. How did the BBC Contagion! Project work? Mathematicians have already developed many excellent mathematical models which predict how diseases spread, however they are always searching for better and better data to feed into these models. Mathematicians want to understand how people move – for example do younger people travel more, or do people travel further at weekends. This type of information is like gold dust to a mathematician who is modelling a pandemic flu outbreak. Without good data, the mathematical models will be limited in their power. Good data about people’s movements can literally save lives in the future. The BBC Contagion! Project launched an app called the BBC Pandemic app. Users downloaded it and then agreed that it could anonymously track their movements for a period of 24 hours. Around 290,000 people used the app, generating enormous amounts of data which mathematicians from around the country can now work with. The BBC also ran a smaller experiment with 500 people in the Surrey town of Haslemere. Mathematician Hannah Fry acted as an infectious agent who visited the town and then studied how many of the 500 volunteers became infected. In both experiments huge percentages of people became infected. When mathematicians used the Pandemic app data they found that the UK would experience a death toll of around 900,000 in the space of two months. Now that mathematicians have such excellent data, they can experiment with different prevention strategies. For example, they modelled what would happen if everyone in the country followed a strict policy of washing their hands regularly. The results were striking and the pandemic spread much more slowly. They also looked at limiting the impact of what are known as ‘Social Super Spreaders’. These are people who infect many more people than average, perhaps because they work in a shop or school. Once again, the mathematical models showed that limiting the impact of these people, perhaps by vaccination, would have a dramatic impact on the pandemic. The BBC Contagion! project is still running and is still looking for volunteers to download its Pandemic app. They are especially looking for teenagers and people in the over 60s category. It only tracks your movements for one day, but you will provide valuable data which mathematicians can use for years to come. If you love mathematics and want to make a difference to the world, then you might also consider becoming a mathematical epidemic modeller yourself. Most people working in this field will begin with a numerical degree such as maths or statistics, followed by postgraduate study which helps them to specialise.